B Ocean Resort in Fort Lauderdale is one of the only Fort Lauderdale hotels that affords you the experience to get married on a private beach. 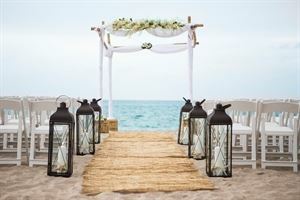 Whether planning an intimate wedding for just the two of you, an relaxed beach wedding to be celebrated with your closest of friends or family, or a dazzling social affair - B Ocean Resort in Fort Lauderdale's professionally trained team of wedding planners will help you every step of the way to ensure that your special day will B Celebrated the way it should be. This exquisite destination offers 487 guest rooms and suites with breathtaking views of the Atlantic Ocean and features the most desirable amenities, including FreeB™ WiFi, 2 outdoor pools, a private beach, the B Active Fitness Center, and delectable dining at Dos Caminos, the famed Wreck Bar and Beach Bar & Grill. Our prime location on the beach makes B Ocean Resort the premier choice among Fort Lauderdale oceanfront hotels. Guests can frolic and play at the beach all day or B Adventurous by taking a local excursion to discover all that Fort Lauderdale has to offer, such as jet skiing, parasailing, shopping, the Swimming Hall of Fame, the Everglades, and so much more. Guests can hop on a Water Taxi, which is located only 3 blocks from the beach hotel, and see the true beauty of the Ft. Lauderdale canal system and discover why the city is known as the “Venice of America.” And our guests can always B In Touch™ with colleagues, friends and family with FreeB™ WiFi available in all public areas and guest rooms.